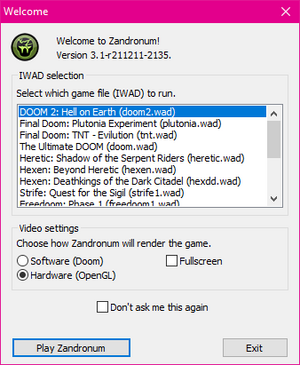 Zandronum's Welcome screen with multiple IWAD files detected. 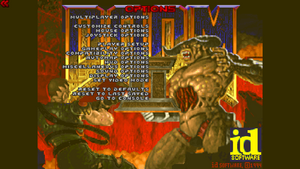 This uses the graphics environment that adjacent to Doom; no eye candy, just normal Doom video display. However, some features like 3D Floors and Voxels can still be displayed, but may be limited. Enforces Zandronum to take the entire desktop or only run a window. If the graphics card is having problems rendering the game in OpenGL and using the latest VGA drivers is not helping to resolve the issue, try enabling this option. However, some features will not properly display as they are most likely not supported for this mode. Additionally, features will not only be limited to just user preferences within the menu, but also in the virtual world and other resources such as 3D Models. The option screen provides the user the availability to customize their keyboard controls or binds, display properties, video settings, and much more. As the option screen is also elaborative in itself, this article will not go in true depth. But, instead, this article will mention each section in a general spectrum. Modify keyboard and mouse controls. Alter mouse sensitivity and other mouse performances. Customize the Joystick controls and performances; however, if the joystick or device is supported on Zandronum, the device will not work. Customize your player! Such available properties are player name, player skin, skin color, announcer type, toggle Autoaim, toggle Unlagged, adjust the players handicap, and several more options are available. Modify the game play environment when playing in Single Player mode by customizing the available DMFlags. Alters the compatibility environment to meet the classical Doom feel or in a modern feel by customizing the available CompatFlags. Adjust the sound properties, such as Random pitches, alternate which MIDI device to utilize, and much more. Modify G15 and G150 Logitech keyboard LCD properties, OpenGL performances, On screen messages, display map layout, and other display properties and performances. Switch rendering engines from either Software or OpenGL, and also switch screen resolutions. The multiplayer options features some of the specific needs for playing online within the game servers. The multiplayer options houses some settings such as adjusting the players properties, calling votes publicly within the server, ignoring a player, and several more options. Literally setup a multiplayer game without needing to access nor setting up a server. This allows the player to setup bots to join within the game and allows the user to completely modify the DMFlags to control the virtual world. Customize the player name, player skin, skin color, announcer type, toggle Autoaim, toggle Unlagged, adjust the players handicap, and many more options. Spy and roam within the virtual world without physically playing. This allows the user to fly and watch the game as others play. Allows the user to switch from one team to another team. Only usable in any team based game modes. This allows players to unanimously vote to change a map, frag and time limits, and many more. This allows the user to specifically ignore a player within the game server. This is useful to 'silent' those that are flooding or harassing players. This page was last modified on 21 August 2016, at 09:49.